FAB-gallery presents: Money in the Eyes. 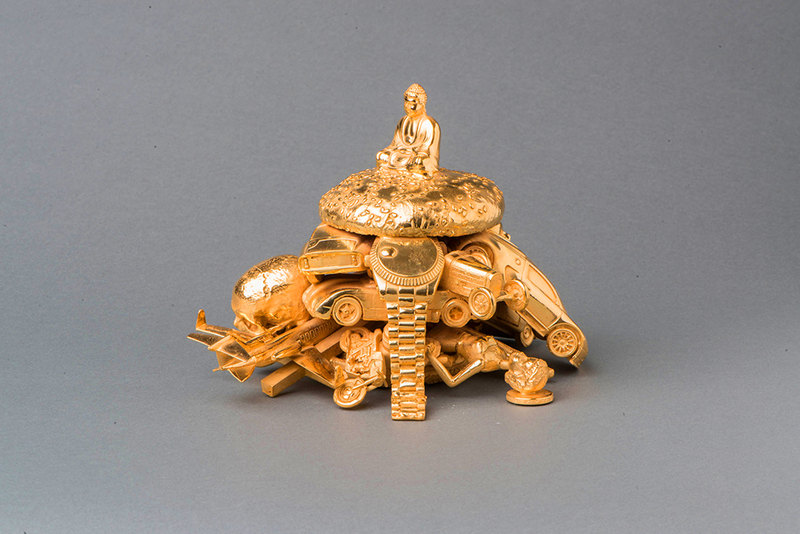 For his first show in Los Angeles, British artist Alexander de Cadenet presents an exhibition that calls attention to society’s obsession with material wealth and explores the relationship between wealth and the spiritual dimension in art . The opening public reception will be held on May 4th from 6:00pm to 9:00pm. Exhibition dates: May 4th through June 4th. Gallery viewing hours are by appointment . FAB-gallery is located at 2001 Main Street, Santa Monica, CA 90405. 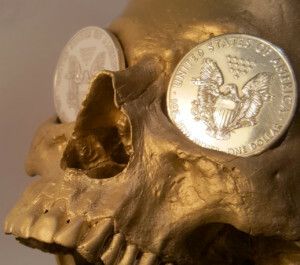 For his first show in Los Angeles, British artist Alexander de Cadenet presents a series of ‘Life-Burger’ sculptures, castings of human skulls with silver dollars in their eye sockets and a new addition to his skull portrait photographic series. Inside a series of bronze McDonald’s burger buns are stuffed the accoutrements of wealth and status – classic Ferraris and Bugattis, Lear jets, Rolex watches and Barbie dolls. 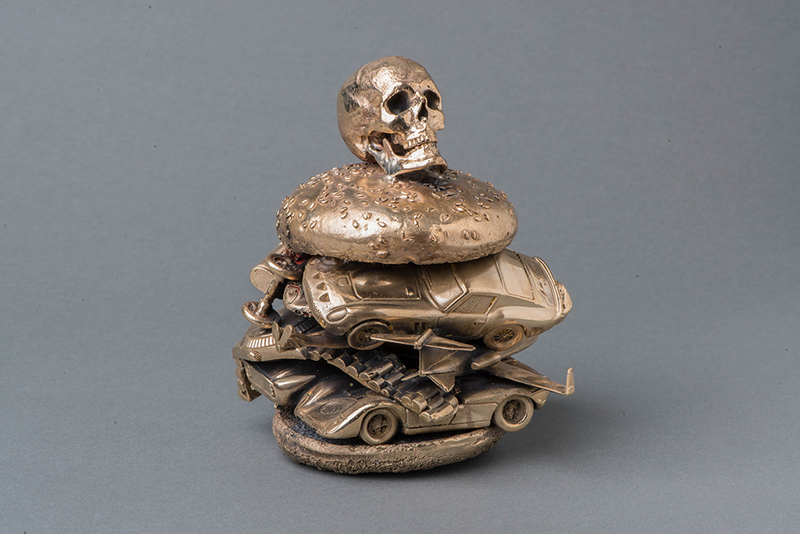 Using a totemic sculptural form, each ‘Life Burger’ is topped with a sacred symbol – a reference to the origins of art such as animals drawn from the earliest cave paintings, a seated Buddha or a human skull. 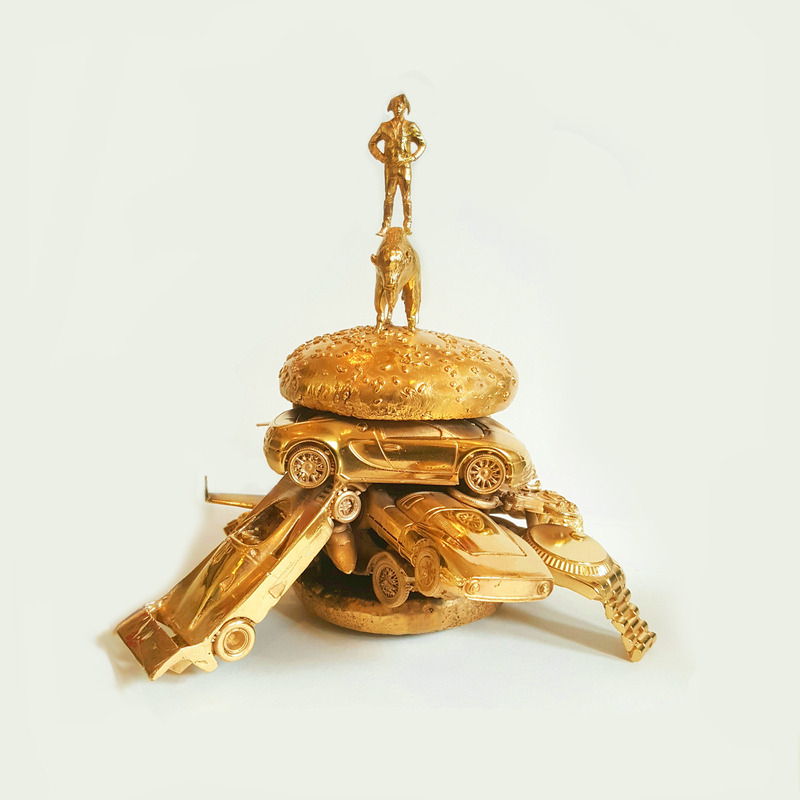 “The Life Burgers seem the culmination of the artist’s journey towards a full engagement with society, offer a commentary on the vanity and essential self-deception of contemporary urban society, with its lust more pronounced than ever in its upper reaches – for expensive toys”. 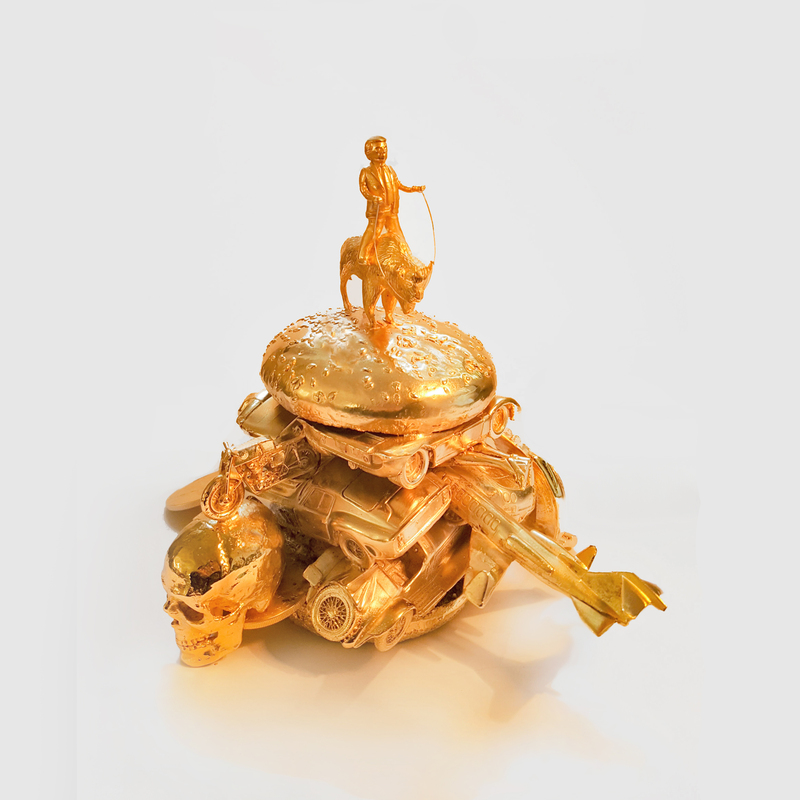 “The Life Burger sculptures combine two opposing functions: they offer a sharp criticism of the society we live in and yet simultaneously they are luxury objects in their own right”. Exhibited for the first time, the Life Burgers shown in Los Angeles include The Veyron Burger, The Skull Burger, The Buddha Burger and the solid silver Trump Burger, a multi-faceted reading of the Trump phenomenon and celebrity culture in America today. 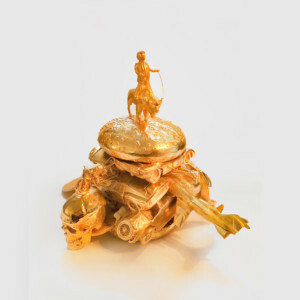 De Cadenet states, “At their root, these works are a search for a deeper meaning in art. They are born out a cultural hero system in which, as Ernest Becker states in his 1973 text ‘The Denial of Death’, ‘people serve in order to earn a feeling of primary value, of cosmic specialness, of ultimate usefulness to creation, of unshakable meaning…by building an edifice that reflects human value, a temple, a cathedral, a totem pole, a sky scraper or a family that spans three generations…The hope and belief is that the things man creates in society are of lasting worth and meaning, that they outlive or outshine death and decay, that man and his products count’”. To coincide with the opening of this exhibition, the artist will also launch a new website, www.newvisionaries.com, as a platform for a community of artists who see their artwork as a portal to a deeper dimension of existence and wish to offer spiritual or philosophical insights into life today through their art. The exhibition will also coincide with the publication in Mind Body Spirit Magazine of Part 1 of the artist’s interview with spiritual teacher Eckhart Tolle on the subject of ‘Art and the Spiritual Dimension’. A meeting between the artist and Tolle in Vancouver in 2016 inspired the development of the New Visionaries platform. 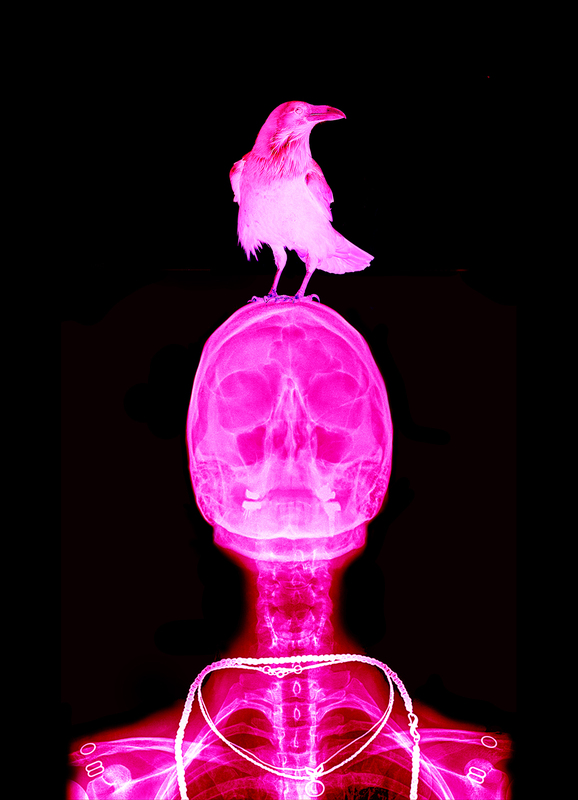 De Cadenet is best known for his x-ray photographic “Skull Portraits” of celebrities and famous historical subjects, including portraits of King Richard III of England, Pharoah Tutankhamun, Adolf Hitler, Albert Einstein and Marilyn Monroe. His previous projects and participations include exhibitions and displays at the Victoria & Albert Museum (1998), Museum of Modern Art Ostende (2001), Courtauld Institute of Art (2003), Tate Britain (2006), Beijing Olympics (2008), and Museum of Torrance (2012).